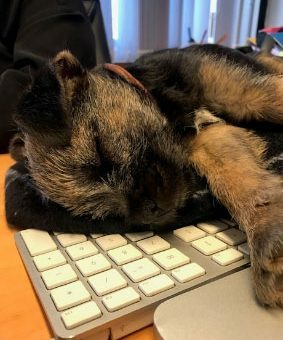 Bramble is a Blue Border Terrier, who has joined the Federation of Tiverton Schools as our School Dog. Her role will be to listen to students reading and giving presentations, and to improve wellbeing and reduce anxiety or stress. Bramble has had a busy start to her career as our School Dog. Since the announcement that Bramble was joining our team she’s been in school three or four days a week, spending most of her time with Mrs Crook in her office where she is learning the typical sounds and smells of the school. She has also made visits to Heathcoat and Rackenford where she children loved meeting her. She has spent lots of time on break and lunch time duty with Mrs Crook and has met lots of our students during this time. She has behaved brilliantly and seems to love the attention! 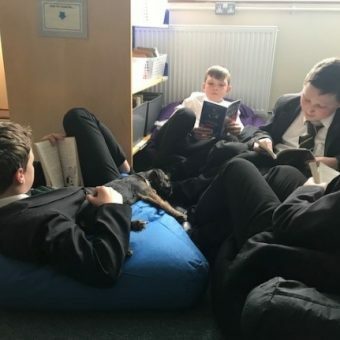 Her training is also progressing brilliantly, and she can now sit, give her paw and understands to lie down on her beanbag in the library when listening to our students reading or practicing speeches. Bramble’s first official duty was in Mrs Kallaway and Mrs Roberts’ Fresh Start lesson, where students read to Bramble while she sat on Mrs Hepworth’s knee. Mrs Kallaway and Mrs Roberts said: “Our Year 7 students were thrilled to have Bramble in their Fresh Start lesson on Thursday. The confidence in their reading really shone through and every single student was eager to stand at the front of the class and read the recipes they had written. Bramble appeared very relaxed throughout”. “[Bramble] was very comforting. She was next to me and looked like she was listening to me. She made me feel less worried about reading. I’d love to read to her again” Tyler, Year 9, THS. “It was nice because it felt like someone was listening to me in a non-judgemental way. It made me much more confident and I’d love to do it again”. Joshua, Year 9, THS. On top of all this, Bramble made her television debut, appearing on ITV Westcountry, where she supported our bid to gain funding for a new school. You can see her in action in the video below. She’s been a complete star and we can’t wait to see how much she’s grown when we get back from the Easter break.